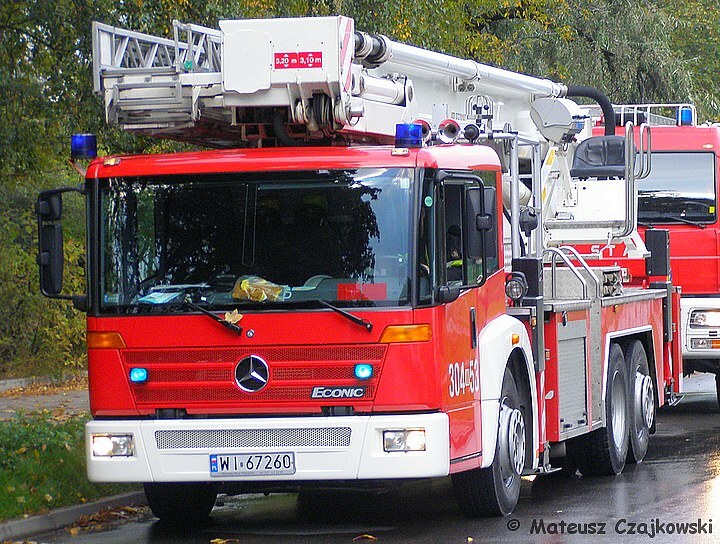 This Mercedes-Benz Econic 2628/Bronto Skylift F37 RL ALP is stationed at Warsaw’s Fire and Rescue Unit 4, in the northern part of the city centre. A 2300 lpm monitor was installed in the rescue basket. 304[W]53 is one of two 37m MB Econic/Bronto ALPs purchased in 2003/4 (the other one is stationed at the Fire and Rescue Unit 7, Bemowo). The first Bronto hydraulic platform joined the Warsaw Fire Brigade in 1989. Today, the ALP fleet includes 5 Brontos (1x 66 2-T2, 1x F42 D, 2x F37 RL, 1x F44 RLX) with 2 more (1x F44 RLX, 1xF32 RLX) to be delivered in 2008. Fire station number 4 of the Warsaw Fire Brigade was established in 1851, taking over the number of the Praga station, which was since then referred to as No.5 (it still is today). The 18th Century Koszary Mirowskie (Mier’s Barracks, were the Royal Calvary used to be stationed) were adapted for the fire brigade. Although the station complex was damaged during and partially dismantled (including the intact observation tower) after the Second World War, it is still used by the Fire Brigade. In the mid-1970s, the destroyed part was rebuilt, with a historic façade concealing a thoroughly modern fire station. Today, the rebuilt southern wing of the complex still houses the fire station, and the original northern wing is home to the Firefighting Museum. It is the only one of the original 19th Century units that still operates from its original location. In the very long term (perhaps 15-20 years), a thorough revitalization of the historic Chłodna Street is planned. The fire station could than be moved to a new location, and the complex could be taken over by the museum. There are also plans for the demolished observation tower to be rebuilt. Station 4 is the second busiest unit in Warsaw. The station’s area encompasses many important locations, including the Old Town (UNESCO World Heritage Site), the Palce of Culture and Science (Poland’s tallest building), the Warsaw Central Railway Station, the University of Warsaw, the city hall, the National Theatre, 3 Metro (underground/subway) stations and the bulk of the capital’s high-rises, including the notorius Złote Tarasy (Golden Terraces) office & shoppong complex, infamous for causing up to 5-6 runs per day…due to a very sensitive fire alarm system. 304-90 – SLOp Ford Focus – unit commander’s car. This is a lot of equipment, which is not surprising considering the characteristics of the station's response area. I should be interested to know what the staffing levels are at the station, and how many personnel are on watch? Added by Rob Johnson on 02 March 2018.